I thought I’d show the stages I went through in the development of this little painting of Lower Largo in the bonny county of Fife, which I painted for my nephew and his wife. It was very refreshing to take a break from creating black & white designs for my adult colouring book (which I hope to publish in the autumn) and re-acquaint myself with brushes and paint. It reminded me of how much I enjoy the physicality of mixing and putting paint on canvas just as much as analysing the tones and colours required. And that elusive quality of painterly-ness that I strive to achieve, still dances frustratingly – just out of reach! The photos speak for themselves, so I’ll ditch the descriptions and let your eyes teach you all you need to know. 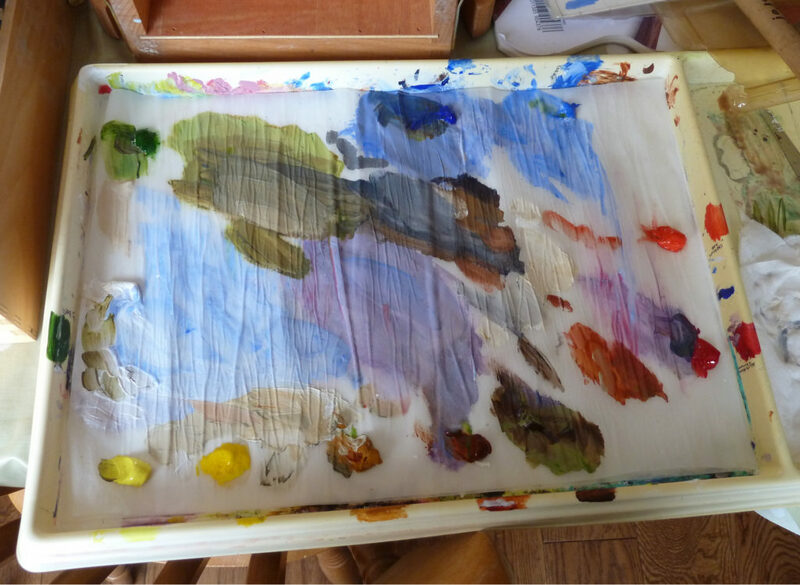 My Daler-Rowney “Stay-Wet” Palette. A great invention!